Our vision has always been to provide every family who has a child with a life threatening or terminal illness with access to a Rainbow Trust carer. If charities received 1% of the value of every estate in the UK, it would generate £71m towards good causes this year alone. 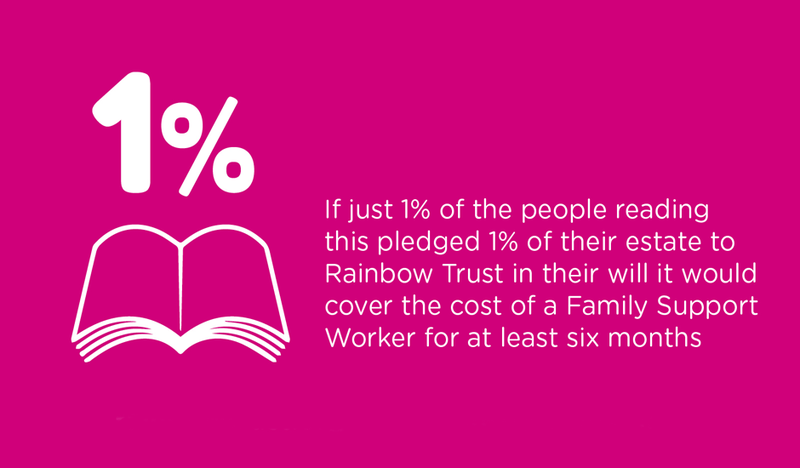 When you have considered your own family in your will, would you spare a thought for a family supported by Rainbow Trust? Your 1% could make a huge different to the lives of the families we support. Your legacy bequest to Rainbow Trust Children’s Charity will provide future support to families that have a life-threatening or terminal illness. Your donation will be used in accordance with your wishes. You can speak, in confidence, about any aspect of legacy giving, to our Legacy Manager or call us on 01372 220085. Making a Will can seem daunting and easy to put off but it’s actually really simple to do. Gifts in Wills are so vital to our work, and ensure that our unique support can continue for many years to come.